I have been on a veggie kick, and have found a great way to get lots of servings. 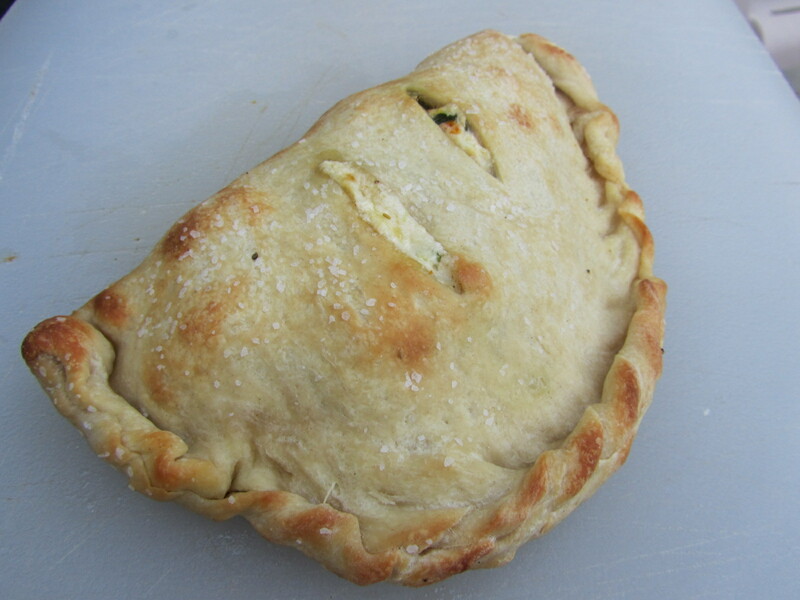 When I halve a recipe, such as this calzone recipe or any number of pasta recipes, I halve the “bad” stuff, like the dough/pasta/cheese/oil, but keep the vegetables at the original amounts. It’s essentially doubling the vegetables, which makes me feel like I’m pigging out and gets me extra nutrients, without extra calories or bad fats. This is my adaptation for one serving size – it was 626 calories for the whole calzone. I hadn’t eaten much that day so it fit into my calories, but this could easily be shared between two people with a side salad each to make it completely reasonable. I also prefer whole milk mozzarella and ricotta, but part-skim could be substituted to save calories, too. Heat the oven to 500° with pizza stone or baking sheet inside. In a large nonstick frying pan, heat the olive oil over moderately high heat. 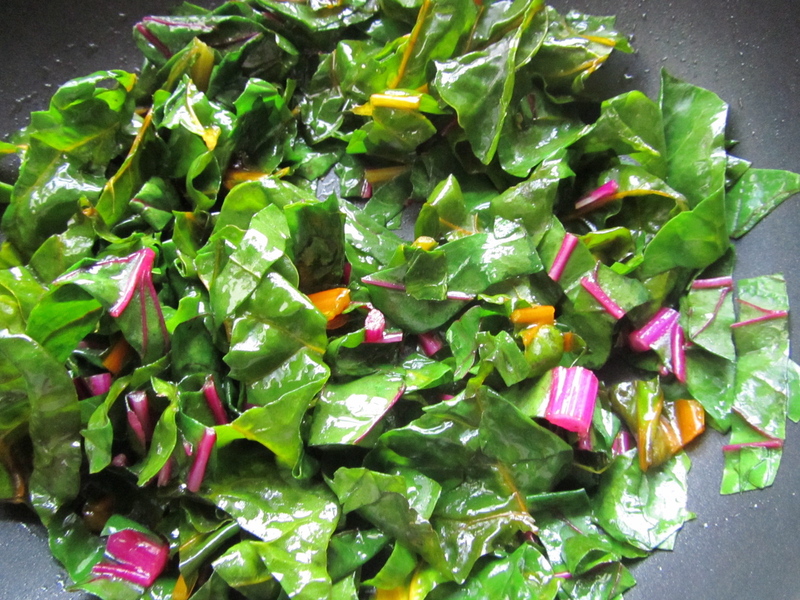 Add the Swiss chard and cook, stirring, until the chard is wilted and no liquid remains in the pan, about 3 minutes. Set aside to cool. Squeeze out any remaining liquid, if necessary. In a bowl, combine the ricotta, mozzarella, sun-dried tomatoes, basil, and salt and pepper to taste. Add the chard and mix well. Roll or stretch the dough into an 8-inch round, on a piece of parchment paper. Spoon the cheese mixture onto one half of the round, leaving a 3/4-inch border. Brush the border with water and then fold the dough up over the filling. Seal the edges by folding the edge of the dough over and pinching it. Transfer the calzone (on it’s parchment paper, if desired) to the pizza stone or baking sheet. Brush with the olive oil (bonus if you use the oil that the sun-dried tomatoes are packed in…yum) and bake until golden, 15 to 20 minutes. 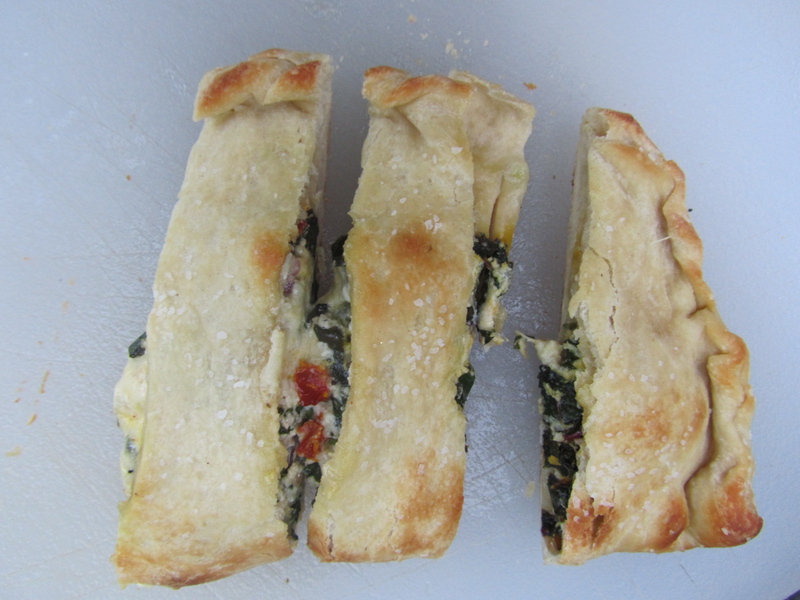 This entry was posted in baking, pizza, vegetables, vegetarian by Laura Zolnoski. Bookmark the permalink.